Whilst Avatar may have rammed 3D down the cake-holes of the masses in December 2009, it was Bolt in February of the same year that introduced many people - especially families - to the relaunch of the digital medium. A Disney film with the backing of newly installed (as of 2006) creative director John Lasseter, the film was nominated for the Animated Film Oscar in 2009 yet, since then, largely seems to withdrawn to the very hind parts of peoples' memories. Perhaps the prevailing reason for Bolt's lack of staying power is the heavy feeling of 'haven't we seen all this before'. There's talking animals for a start - hardly something we'll ever tire of but familiar nonetheless, especially for Disney - and a Homeward Bound-style, get-me-there-before-I-get-squished-by-a-car narrative, which fails to avoid that most-visited of dog-film locations, The Pound. Mix well with large doses of The Aristocats, Oscar and Lady And The Tramp and you've got a solid recipe for anonymity. At this point it would be fair to expect a 'but this is a real shame - Bolt doesn't deserve anonymity', style refrain but the sad fact is that if any film deserves a back-of-the-mind shelving, it's this one. Sure there is, like every animal film ever, a comedy sidekick (Matt Walton's Rhino) who tries hard to rescue our attention and John Travolta as the voice of Bolt is cracking casting but there's never really any heartstring pulling, originality of plot contrivance or dynamic action to drag this up to the next level. The opening battle - well choreographed and naturally hilarious - is as close as the film ever gets to goodness, let alone greatness. 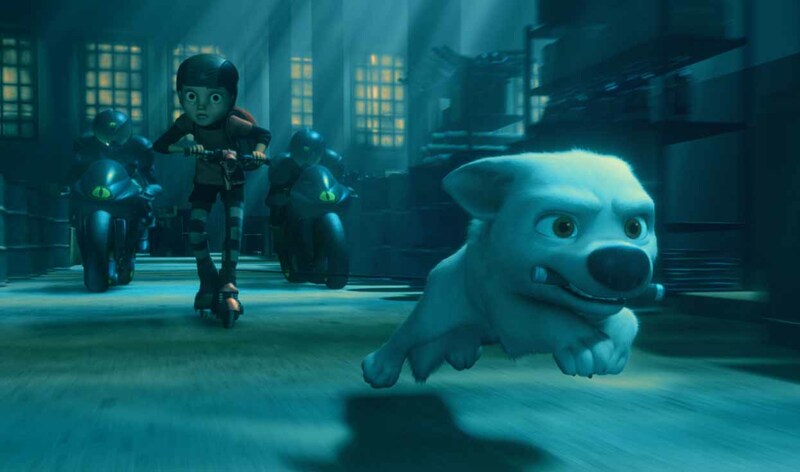 If anything, the averageness of Bolt, acceptable averageness though it is, points to the rightly elevated pedestal where Disney (and Pixar) now find themselves. Averageness, trotted out in the same old formula, just isn't good enough any more if you want your film to be remembered longer than the sickly sweet popcorn your target audience are munching. Well said!! It is a animated feature that has disapeared from our collective memories isn't it? I liked it, but as you say the Homeward Bound feel was too strong and felt of all having been done before. And yet if this played on telly I would quite hapily watch it because it is far from bad. Just unmemorable. Brent - yes, agree completely. It's not one I'm eager to revisit but its more than passable enough to warrant watching on the TV. Nostra - The hamster is great. Absolute scene stealer.